PESHAWAR: The PTI-led federal government has planned to replicate Khyber Pakhtunkhwa’s Sehat Sahulat Programme throughout the country. Sources told Dawn that Prime Minister Imran Khan had decided to constitute a taskforce to introduce immediate reforms in the health sector at national level. They said the task force would be tasked with replicating the Sehat Sahulat Programme nationwide. The sources said the task force would also examine at several reforms initiated by the KP health department during the last PTI government. They said the task force would have health experts from abroad and Shaukat Khanum Memorial Cancer Hospital and Research Centre Lahore to ways and means to strengthen regulations and improve patient care across the country. The sources said the SSP launched by the KP health department in Jan 2017 would promise free treatment to the poor people. They said Premier Imran Khan, whose party had ruled KP from 2013 to 2018, had been an admirer of health reforms in the province and credited the health department for it in public meetings, interviews and tweets. The sources said the task force’s possible members had already been asked to implement the KP Medical Teaching Institutions Reforms Act, 2015, in Punjab and Balochistan, where the PTI had coalition governments. They said the Act suggested financial and administrative autonomy to teaching hospitals for effective health delivery. The sources said the Sehat Sahulat Programme initially covered 51 per cent of KP population but was later extended to 69 per cent population (2.48 million families) after the health department found the initiative to be effectively benefiting the people. They said the health department funded the programme from the annual development plan budget to provide free treatment to the people in line with the PTI’s election manifesto. The sources said the programme under which Sehat Insaf Cards were distributed to families for treatment up to Rs540,000 each at designated hospitals. 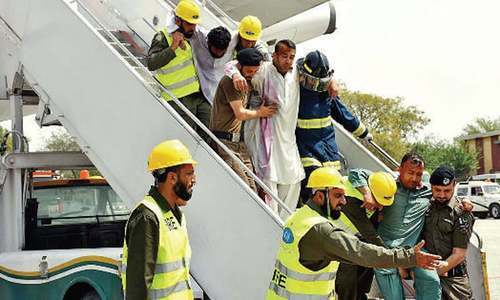 They said the KP government had released around Rs4.5 billion for the programme benefiting more than 125,000 people, including over 7,000 heart patients. The sources said the health department had authorised more than 100 hospitals both government and private to extend free service to the people with cards. They said the proposed task force would seek the KP health department’s support for the nationwide launch and execution of the Sehat Sahulat Programme. The sources said they’re confident that the programme would have a smooth nationwide execution as the KP health department had done necessary planning and preparation for the model, which required replication only. They however said there were some issues, which needed the early resolution. The sources said the KP health department had struggled to track down hundreds of deserving families at the time of the Sehat Sahulat Cards’ distribution as the data taken from the Benazir Income Support Programme had the particulars of family heads and not all family members. They added that the department’s request to link that data with the National Database Registration Authority’s was also shot down by the then PML-N-led federal government. The sources said as the PTI had formed the government in the centre, too, that data should be linked with Nadra’s without delay to trace all people concerned easily. They said hundreds of people had changed the places of their living since the BISP had compiled their particulars and therefore, only Nadra could help trace them.